You are here: Home » GENRE » Fantasy » On Spec: The Canadian Magazine Of The Fantastic vol 28 no. 3 #106 (magazine review). On Spec: The Canadian Magazine Of The Fantastic vol 28 no. 3 #106 (magazine review). ‘On Spec’ is another small-size magazine enthusiastically dedicated to speculative stories and is available both in hard copy and e-bookishly. In this issue, the fiction opens with ‘A Lab Of One’s Own’ by Alec Austin and Marissa Lingen which concerns a wealthy young lady named Violetta who dabbles in alchemy. She goes to Wien to get more supplies and has jolly romps with some pals while also aiding one in her own experiment. Wien is presumably Vienna as the Hapsburgs are mentioned. It evoked something of the atmosphere of ‘Little Women’ or ‘Pollyanna’ and is probably more one for the ladies. I’m only a man but I quite enjoyed it, as I generally do Marissa Lingen’s stories. I really liked ‘Rising Cold’ by Al Onia. This opens in Cryo Corp’s lunar lab where Prescott Wayne is visiting the facility in order to make a report to his boss. Chimpanzees are being deep frozen to test what might happen to humans. Not fond of captivity, one female chimp has bitten her thumbs off with the stress. Elizabeth, Prescott’s ex-wife and vegetarian is on the Moon and not keen on his activities, which is one of his major reasons for going. A great story with a heroic ending that raises important issues. It reminded me somewhat of my favourite Heinlein story ‘Jerry Was A Man’ and by coincidence, I read it the day after watching ‘The Measure Of A Man’ a ‘Star Trek: TNG’ episode in which Data’s status is the main issue. Al Onia is interviewed by Roberta Laurie in a follow-up article. Amos Adams stops a lynching in ‘Amos Adams Stops A Lynching’ by James Van Pelt. Amos owns most of Silverton, a small mining town in Colorado, and is the sheriff, too. When a man is apparently shot at random by some stranger, who appeared out of the blue, he must investigate. It’s a well-done time travel story with an important message about dentistry and I enjoyed it hugely. ‘Nothing Can Stop The Gravytrain’ is the catchphrase and almost complete vocabulary of a super-villain that emerged from a cocoon in Etobicoke, Canada in 1969. A child mutated into ‘a giant viscous gravy-like blob that consumes everything it comes into contact with’. Claude Lalumière’s story is told in bits of transcripts by various people, including super-heroes from Canada’s Just League and those super-villains who are their foes. In this modern take on super-people, they all have websites featuring interviews and videos, like any celebrity. Good fun. No one says ‘Blessed are the cheesemakers’ in ‘Sermon On The Mount’ by Robert Runté but it is definitely not a serious look at history. A team of time travellers go back to film the great event and then some fool potter parks his cart right in front of their camera. Trouble ensues and there are more complications. A well-structured time travel story that manages to treat the main event with respect despite the shenanigans it causes. Apart from ‘Rising Cold’, the other stories in this issue are generally comic and there’s nothing wrong with that. 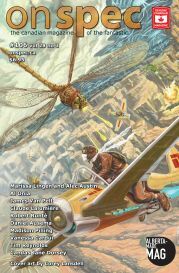 As well as the aforementioned interview with Al Onia, the non-fiction includes a tribute to the late lamented Hank Hargreaves and Brian Aldiss in, ‘Two Gentlemen Of Science-Fiction Are Gone (In Memoriam) by Candas Jane Dorsey. A guest article and interview by and with singer Vanessa Cardui. Disguised as a modern poem (no rhyme) ‘Alien Artifact Restoration’ by Daniel Ausema is actually a pretty good bit of musing about how archaeologists might misinterpret finds of non-human origin. A good piece in another good issue from the worthy crew at ‘On Spec’, still holding aloft the torch of speculative short fiction in Canada. A Mari Usque ad Mare. « Wild Cards IV: Aces Abroad edited by George RR Martin (book review).